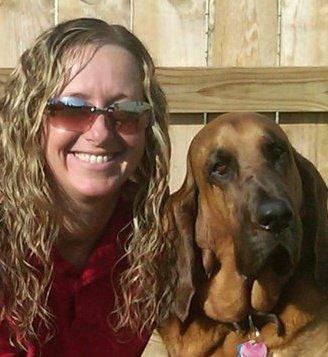 Kelly Haggard is a dog professional who trains and works with her Bloodhounds in search and rescue (SAR). Learn how these dogs are trained, what the teams face, and how to get started in search and rescue work yourself. LoveToKnow (LTK): Kelly, thanks for agreeing to talk about your work with search and rescue. You mentioned that your Bloodhounds are scent specific. What does this mean? Kelly Haggard (KH): This means that they are trained to find a "specific" scent when locating their subject. Some types of SAR dogs are trained to find any human scent. These are usually disaster dogs that search rubble and look for any live human being so that they can indicate this to their handlers. This often makes rescue more efficient. A "scent specific" Bloodhound is trained to take scent from an article the handler gives the dog to sniff. For example, the handler might have the dog sniff a hat or glove, something that only the missing person has touched. If that person's scent is in the area, the Bloodhound should take the same trail as the person he is trying to locate. If that particular scent is not found by the Bloodhound, it is likely that person was not there. A well-trained, scent-specific Bloodhound should never take a trail if that person's scent is not there. LTK: When you get a puppy, what are some first steps you take to train him? KH: When first introducing our Bloodhound puppies to trailing, we immediately introduce them to human scent. We will have the person who plans to hide for the dog lightly touch a sterile gauze pad. Only this person will touch the pad so there's no cross contamination with another person's scent. The gauze is placed into a Ziploc baggie. The baggie is then sealed. Next, that person will walk a very short distance, maybe several yards away, and just duck behind a large tree or bush. The pup is placed in harness, allowed to smell the scent in the bag, and the handler says a word which will be the "command" for the pup to get to work (My Bloodhounds' command is "track."). Next, we let the pup run to where the person went, and if the pup needs help, we assist him so he always has a positive end to each trail. We keep the trails very simple when the pups are very young so as not to frustrate them. Trails are set in areas where it is easiest for a pup to get scent, like grassy type areas with minimal obstacles. LTK: You also do various training exercises throughout the year. What are these like? KH: We do a great deal of our training in areas where we are most likely to be called out. Since we live in an urban area, we do a lot of our training in that type environment so that the dogs are used to the sounds and terrain you might come across in the city. We get them used to cars, people, concrete, pavement, etc. We try to set up as many distractions as possible so that the dog learns to focus on the trail and ignore everything else. The dogs become accustomed to all the above factors, so when fully trained, they are not bothered by any distractions. Rather, they are completely focused on finding the human that the scent belongs to. LTK: Your dogs are specifically trained to find missing people. Can you walk us through a typical job you might be called out on? KH: Here is an example of a case we've been used on: The local sheriff's department found a child's bicycle alongside a heavily traveled county road. There was a helmet sitting on the handlebars. After law enforcement went door-to-door and concluded that this bike did not belong to anyone from the neighborhood, they called our unit. Another handler and I arrived at the scene. We spoke with each officer present to find out if they touched anything on the bicycle. If they touched the helmet and we used this to scent the dogs off of, the dog would go to the officer because the dogs are trained to find the freshest scent, and this would be the freshest scent. In order to have the best chance at running a good trail, we decided to use the pedal of the bike as our scent article, because it was most likely no one had touched this area. Most likely, the handlebars or helmet had been inadvertently touched by officers in trying to find out the owner of the bicycle. The handler wore sterile gloves and used sterile gauze pads to place on the pedal to obtain the scent off that area. Then the handler took her Bloodhound to an area where it was most likely a child would have been, at the edge of the road near the bike, and placed the harness on her Bloodhound. She held the gauze pad in front of her Bloodhound, which at this time is inside a plastic baggie, and gave the command to look for the person. The dog headed towards the road and then headed north. It was very clear the dog had picked up the scent of whoever was riding that bike. She continued several hundred yards. As this was going on, a van pulled up from the other direction with a young woman inside it, and a little girl. Earlier that day, the little girl wanted to ride her bike, but got tired at that location. Her mother picked her up there and drove north, leaving the bicycle. The bloodhound was following the exact path they had gone in the vehicle. Luckily everything was okay, but you never know, so it was good that the police called us. One thing we tell law enforcement is that our dogs don't lie, but people do. In this case, it was just the mother not thinking. After she realized the huge stir this caused in the neighborhood, she was very embarrassed about not coming back for the bicycle right away. LTK: Tell us a little about Indy Mantrailing K9 SAR. KH: We are a not-for-profit, 501c3, all volunteer search and rescue group. We use our Bloodhounds to find lost, missing and abducted individuals. We are basically on call 24/7, and do not charge for our services. We will only respond to law enforcement, so we do not show up at scenes unless the officer in charge has called us. We rely on the community for donations and grants to make it possible for us to do our job. Donations pay for things like travel expenses and training seminars, which we participate in several times a year in order to keep our K9s trained. LTK: The work done through your group is all volunteer work. Do all the dog handlers just donate their time and use of their dogs? How does that work? KH: Yes, each handler is solely responsible for the purchase of his or her K9, and for all expenses related to that K9, including veterinary expenses, maintenance and all expenses related to getting the dog K9 trained to be operational. By the time each handler's K9 is two or three years old, an owner will have spent upwards of $12,000 on all the above. It is definitely a labor of love. It is a lot of hard work for both handler and K9 as well as the fact that it can be quite expensive and time consuming. You have to love what you are doing, and many folks really do not last in this field because their daily life gets in the way. LTK: What can law enforcement officers do to make your job easier? KH: Well, many things. One is that they should call the Bloodhounds out the moment they find that a person is missing because time is our biggest enemy. Often, they will use every other tool in trying to locate the missing person, and then call the Bloodhounds out days after the person is missing. So many things work against us by that time, like the elements, and the fact that so many people have been in and out of that scene. This makes it much more difficult for the handler to get a scent article that has not been contaminated with another person's scent. Also, keep the scene clear of other people, or as few people inside the scene as possible. Many times in missing person cases, you will hear of huge search parties with numbers in the thousands trampling a scene. What this does is make it more difficult for any handler to obtain a clean scent article with only that missing person's scent, and this also can cause important evidence to be lost. The best thing law enforcement can do is not let anyone who is not closely related to the case be on the scene before the Bloodhound team comes in. We have a saying, "Your finish is only as good as your start," and the better of a start we can get on finding the missing person, the better our chances are of having a good finish. LTK: What advice would you have for someone thinking about getting into this line of work? KH: Well, if you are looking for something fun to do with your dog, this is not the activity for you. My advice is take up obedience or a fun sport like agility or something like that. This is extremely serious work, and if you are not up for being awakened out of a dead sleep at three a or having to miss your nephew's christening to go look for a missing person, this is not the thing for you. It is hard work, and you have to spend many of your daily waking hours doing this, whether it is training for your K9 or training for yourself. You need to be physically fit to do this, and also mentally equipped to deal with something as traumatic as finding a child that has been murdered by a parent. It is very hard on you mentally and physically, and sometimes it is not much fun. However, if you can handle all of that and you are prepared to dedicate everything to this, I say go for it. I will admit, I am part of a small percentage of the folks who stay in this field. I would say approximately 85 percent of the people who I knew that were doing this back when I started are no longer doing it. It takes its toll on you. So think long and hard about the reasons you want to become a search and rescue K9 handler, and then decide if it is really the right fit for you. LTK: You currently have a couple of Bloodhounds. Any plans to add to your canine family? KM: We currently own two Bloodhounds, Jersey Joe, who is my Bloodhound, and Cash, who is my better half, Mike's Bloodhound. Cash is just 21 months old and still being trained. Jersey Joe is six years old, and probably in the next year or two I will be getting a puppy to start all over. Normally, most Bloodhounds are nearing retirement from search and rescue by about the age of seven to nine, depending on the dog, so I would like to have a pup ready to take over when Joe decides he wants to retire. After that, he will just become my pet, and still my best buddy, to live out his days doing whatever he wants because he has worked very hard and deserves it! A very warm thank you to Kelly Haggard for sharing her expertise in the area of canine search and rescue. Hopefully more people with be inspired to get involved with search and rescue training.